Every Christian retail store owner and their staff are experts at doing all the right things to keep customers coming back and spending virtually all their Christian product budget at their local store, right? Don’t we all inherently engage in superior customer service? Alesandra is, of course, so very right. In today’s diverse, price-sensitive, “I want it now” retail climate, it is more challenging then ever to cultivate and maintain loyal customers who think first and foremost about your store for their purchases. We consider our labor of love to be a “retail ministry,” meaning that while we are a full-service Christian bookstore, we also take time to pray with our customers and to engage them in meaningful conversations. In fact, one of our daily prayers at the store is: “Lord, let us minister and be ministered to as Your will provides today.” And it works! On the practical side, we strive to say “yes” to as many requests as possible. Blessings has always been known for our willingness to try to track down any book, CD or other product from as many different sources as it takes. Even though we are not always successful, the customers tell us that they appreciate our efforts and will come back for something else in the future. Susan Friedmann, “The Tradeshow Coach,” put together what she called “The Ten Commandments of Customer Service” that seem to apply to just about any kind of business. We will “borrow” her headings but offer the Blessings’ version of commentary. 1. Know who is boss. It is vital to realize that “the customer is king” and is the reason why your store exists. It goes without saying—but I’ll say it anyway—without your customers, there is no store. While you are conducting your business as “unto the Lord,” be sure to treat your customers as the “royalty” that they represent. 2. Be a good listener. We have found that many of our customers will share a great deal of information about their lives and, indirectly, about what you may have in your store that would contribute to bringing solutions to their situation or need. If possible, stop what you are doing and directly engage your customers when they tell you what is on their heart. 3. Identify and anticipate needs. Apple founder Steve Jobs obviously knew something about this concept. His quote, “Get closer than ever to your customer. So close that you tell them what they need well before they realize it themselves” gives you a glimpse into one of the reasons for his success. While we might not have the ability to create products like he did, we can and should identify and react to seasonal and traditional trends. Likewise, the prudent owner will constantly review sales patterns for product areas in their store that need updating, restocking and/or a fresh merchandising look. 4. Make customers feel important and appreciated. At Blessings, we try to greet customers by name as often as we can. Sometimes embarrassing mistakes are made, but it is still a good idea! We strive to provide just the right amount of attention to each customer by discerning their demeanor and engaging them in conversation. One phrase I like to use is, “We’re not ignoring you. We are leaving you alone. There’s a difference.” Customers seem to appreciate that as you let them browse while staying aware of their presence. Remember, many purchases are made by emotional response, so creating an atmosphere of friendliness and serenity can cause a customer to linger and perhaps add a few items they weren’t originally planning to buy. 5. Help customers understand your store’s systems. Letting your customers in on your store philosophy and business model draws them into your retail “family” and makes them feel that your store is theirs too. For instance, one of our tenets has been to “go wide instead of deep,” so we can offer a broader selection. Next-day shipping from two distributors helps us make this a viable practice. It is also wise to let the customer know about your ordering patterns and limitations so they will be more likely to realistically rely on your store for special orders. As caring members of the community, we also try to say “yes” to requests for help from churches, Christian schools and organizations. Our assistance usually takes place in the form of products or gift cards for fundraising raffles, auctions and the like. The power of “yes” serves others and enhances our position in the minds of our customers. 7. Know how to apologize. When something goes wrong, be ready, willing and able to offer your sincere apologies. We have found our customers to be extremely gracious when we have had to express our apology for something that didn’t go quite right. Although it can be a stretch with some of those “EGR” (Extra Grace Required) customers, keep in mind that your gentle words may be the only ones that they hear that day and that the Lord would want you to treat His son or daughter with the utmost care. Not that this story is routine or represents any kind of super-special effort; it does, however, illustrate the type of customer service that larger corporate retailers are simply unable to perform. We also have always offered free imprinting on any imprintable items purchased at our store, and we have been known to gift-wrap and ship items to customers, family members and prisoners. 9. Get regular feedback. It is always a good idea to know where you stand with regard to customer service. If you are paying attention, the customers will tell you in their comments and with their buying habits. Asking a few key customers for their candid comments and suggestions is also an effective way to gauge your store’s progress. If you happen to hear a negative comment, try not to get defensive, but pray about it and let the Holy Spirit show you what you may need to do in response. 10. Treat your employees well. Your employees can exert a “make or break” difference on your customer service reputation. Fortunately, we have only had one bad employee experience, but we know that these experiences are out there. Ideally, your employees will think, feel and act the same way you do about the store. If you treat them with respect, they will represent your interests well when they are performing frontline duties in your store. We are often buoyed by customers who say such things as “I love your store” or “I’m so glad you are here.” Customer comments like that can carry you through a lean day. For 10 years we have made every effort to establish a solid reputation for superior service and to create a friendly and desirable place for customers to spend some time. Sometimes serving your customer just means providing a brief sanctuary from the world. 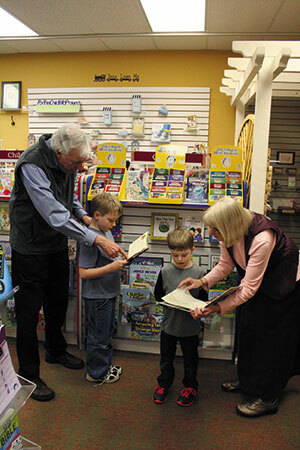 Greg Culbertson and his wife, Sharon, have owned and operated Blessings Christian Bookstore in Harrisonburg, Virginia, since 2005. Greg was once the book buyer for The 700 Club and is now on the staff of Victory Weekend Ministries.